"Cornfield developed an inequality linking the observed risk ratio to the prevalence of the omitted variable..." "Cornfield's inequality was the first formal method of sensitivity analysis in observational studies or non-randomized experiments." Gastwirth, Krieger and Rosenbaum (2000): Cornfield's Inequality in the Encyclopedia of Epidemiological Methods, p 262-265. 1975 A Statistician's Apology. Jerome Cornfield's ASA address as the ASA President. 2015 Jerome Cornfield's Bayesian approach to assessing interim results in clinical trials by JJ Schlesseman in James Lind Library. 2013 Jerome Cornfield: The statistician who established risk factors for lung cancer and heart disease by R. Wicklin in SAS Blog. 2013 Tribute to Jerome Cornfield: A Legacy in the Field of Statistics by SW Greenhouse and M. Halpern in Amstat News. 2010 Commentary on Cornfield (1951) by JJ Schlesselman. "Perhaps one of the advantages that Cornfield had was his lack of any sustained formal training in either epidemiology or biostatistics." Perhaps the growth of formal epidemiology courses over recent decades is doing a disservice to the originality of thinking in the field." "Cornfield’s initial degree and graduate study were in history." 2009 Commentary: Cornfield, Epidemiology and Causality by Joel B. Greenhouse. 2009 Commentary: Cornfield on cigarette smoking and lung cancer and how to assess causality by Marcel Zwahlen. 2009 Epidemiologic Causation: Cornfield’s Argument for Causal Connection between Smoking and Lung Cancer by Roger Sanev. Humana Mente. 2000 Cornfield's Inequality in the Encyclopedia of Epidemiological Methods. By Joe Gastwirth and Paul Rosenbaum. 1999 Simpson's Paradox and Cornfield's Condition By Milo Schield in the ASA Proceedings of the Section on Statistical Education. Reviews the Cornfield conditions and reproduces the entire appendix of Cornfield classic response to Sir Ronald Fisher to which Fisher never replied. 1982 Mantel N.. Jerome Cornfield and statistical applications to laboratory research: a personal reminiscence. Biometrics 38(Suppl):l7-23. 1982 Greenhouse, Samuel W. (1982). "A Tribute". Biometrics 38 (Proceedings of "Current Topics in Biostatistics and Epidemiology." A Memorial Symposium in Honor of Jerome Cornfield): 3–6. JSTOR 2529847. 1982 Abstracts in Biometrics (1) The contributions of Jerome Cornfield to the theory of statistics by M Zelen. (2) Jerome Cornfield's contributions to epidemiology by SW Greenhouse. (3) Jerome Cornfield's contributions to epidemiology by SW Greenhouse. 1960 Cornfield's contribution Johns Hopkins Biostatistics History. 2012 Bayesian clinical trials in action by JJ1 Lee and CT Chu. Stat Med. 2012 Nov 10;31(25):2955-72. doi: 10.1002/sim.5404. Epub 2012 Jun 18. 2005 'Jerome Cornfield' by SW Greenhouse in Biostatistics. 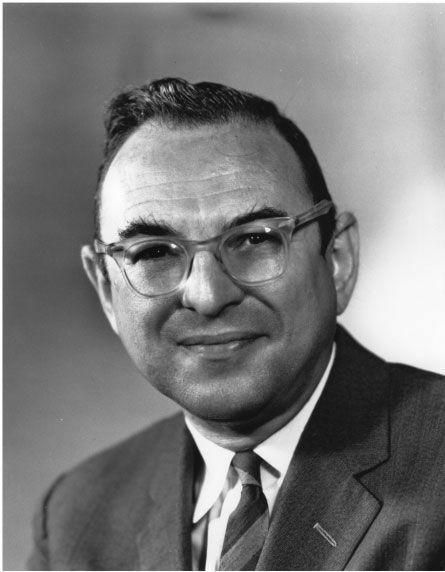 "Born in 1912 in New York City; died in 1979 in Herndon, VA. Best known for helping develop Cornfield's inequality linking the observed risk ratio to the prevalence of the omitted variable in smoking and nonsmoking groups." Excerpt1: "When epidemiologists began turning their attention to the study of chronic diseases, prospective cohort designs for finding causes of, or risk factors for, chronic diseases were in many instances impractical. They therefore turned to case–control or retrospective types of strategies. A problem with these designs, assuming they are well planned, is that they do not yield traditional estimates of absolute risk or relative risk. Cornfield, in 1955 at the Third Berkeley Symposium in Mathematical Statistics and Probability [4, 18], presented a derivation which demonstrated that under a rather strong assumption (but rather reasonable in the case of chronic diseases) the odds ratio or cross product ratio (in a 2×2 table) is a fairly good approximation of the relative risk. The assumption was that the incidence of the disease under study should be small." Excerpt2: "the question of the effect of latent, unobservable variables. Sir Ronald Fisher, in arguing against the smoking – lung cancer relationship, had offered an hypothesis that postulated the existence of some constitutional factor (latent and unobservable), e.g. genetic, that caused cancer and that was also associated with the need to smoke. Without giving the details of his argument here, Cornfield demonstrated that if cigarette smokers are shown to have nine times the risk of nonsmokers of getting lung cancer, but that this elevated risk is due, not to cigarettes, but to some latent factor X, then the proportion of smokers having X must be larger than nine times the proportion of nonsmokers having X. Cornfield’s conclusion was that if X was a causative agent of this magnitude, then the relationship between the latent factor X and the observed agent would probably have been detected much before that of the agent and the disease. No such factor has been found." 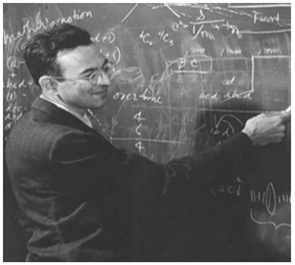 1982 The contributions of Jerome Cornfield to the theory of statistics by M. Zelen. Biometrics. 1982 Mar;38 Suppl:11-5. 1982 Jerome Cornfield's contributions to epidemiology by SW Greenhouse. Biometrics. 1982 Mar;38 Suppl:33-45. 1982 Jerome Cornfield's contributions to the conduct of clinical trials by F. Ederer. Biometrics. 1982 Mar;38 Suppl:25-32. Hill, A. Bradford (1952). The Clinical Trial. New England Journal of Medicine 247. No 4 P. 113-119. Hill, A. Bradford (1953). Observation and experiment. New England Journal of Medicine 248:995-1001. Hill, A. Bradford (1965). The environment and disease: association or causation? Proceedings of the Royal Society of Medicine 58:295-300. Ben Christopher (2016). Why the Father of Modern Statistics Didn't Believe that Smoking Caused Cancer. Cornfield J (1954). Statistical relationships and proof in medicine. The American Statistician 8(5):19-21. Cornfield J (1956). A statistical problem arising from retrospective studies. Proceedings 3rd Berkeley Symposium on Mathematical Statistics 4:135–48. Cornfield J, Haenszel W, Hammond EC, Lilienfeld AM, Shimkin MB, Wynder EL (1959). Smoking and lung cancer: Recent evidence and a discussion of some questions. 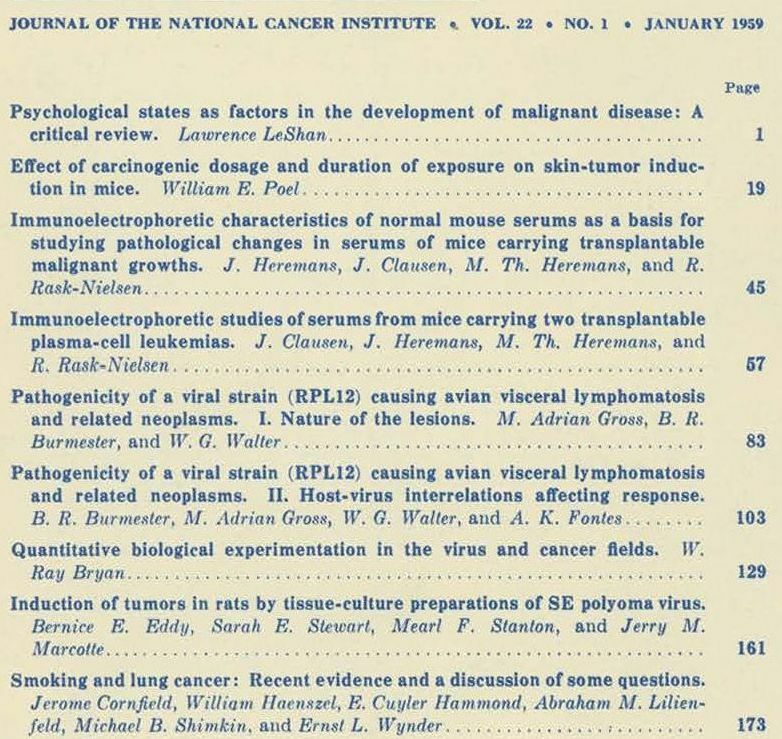 Journal of the National Cancer Institute 22 (1):173-203. TOC. Copy in 2009 Int. J. Epidemiology. Summary: "This report reviews some of the more recent epidemiologic and experimental findings on the relationship of tobacco smoking to lung cancer, and discusses some criticisms directed against the conclusion that tobacco smoking, especially cigarettes, has a causal role in the increase in broncho-genic carcinoma. The magnitude of the excess lung-cancer risk among cigarette smokers is so great that the results can not be interpreted as arising from an indirect association of cigarette smoking with some other agent or characteristic, since this hypothetical agent would have to be at least as strongly associated with lung cancer as cigarette use; no such agent has been found or suggested. The consistency of all the epidemiologic and experimental evidence also supports the conclusion of a causal relationship with cigarette smoking, while there are serious inconsistencies in reconciling the evidence with other hypotheses which have been advanced. Unquestionably there are areas where more research is necessary, and, of course, no single cause accounts for all lung cancer. The information already available, however, is sufficient for planning and activating public health measures." Cornfield, Haenszel and Hammond (1960). Some aspects of retrospective studies. Journal of Chronic Diseases 11:523-534. Cornfield, Gordon and Smith (1961). Quantal response curves for experimentally uncontrolled variables. Bulletin of the International Statistical Institute 38: 97-115. Cornfield J (1962). Joint dependence of risk of coronary heart disease on serum cholesterol and systolic blood pressure: a discriminant function analysis. Federation Proceedings 21:58-61. Cornfield J (1966a). A Bayesian test of some classical hypotheses, with applications to sequential clinical trials. Journal of the American Statistical Association 61:577-594. Cornfield J (1966b). Sequential trials, sequential analysis and the likelihood principle. The American Statistician 20:18-23. Cornfield J, Greenhouse SW (1967). On certain aspects of sequential clinical trials. In Proceedings of the Fifth Berkeley Symposium on Mathematical Statistics and Probability, Vol. 4. (eds. Neyman and LeCam) pp. 813-829. Cornfield J (1969). The Bayesian outlook and its applications (with discussion). Biometrics 25:617-657. Cornfield J (1970a). Fixed and floating sample size trials. In Symposium on Statistical Aspects of Protocol Design. Engle RL, Jr. (Symposium Chairman). Bethesda, Maryland: Clinical Investigation Review Committee, Clinical Investigations Branch, National Cancer Institute, National Institutes of Health, pp 181-187,with discussion on pp 197-204. Cornfield J (1970b). The frequency theory of probability, Bayes' theorem, and sequential clinical trials. In Bayesian Statistics (eds. Donald L. Meyer, Raymond 0. Collier, Jr.) Itasca, Illinois: Peacock Publishers Inc., pp 1-28. Cornfield J (1970c). Discussion by J. Cornfield, B.M. Jill, D.V.Lindley, S. Geisser, and C.M. Mallows. In Bayesian Statistics (eds. Donald L. Meyer, Raymond 0. Collier, Jr.) Itasca, Illinois: Peacock Publishers Inc., pp 85-125. Cornfield J (1971). The University Group Diabetes Program. A further statistical analysis of the mortality findings. Journal of the American Medical Association 217:1676-1687. Cornfield J (1974a). Statement of Dr. Jerome Cornfield, Chairman, Department of Statistics, The George Washington University, Washington, D.C. In Subcommittee on Monopoly (1974), pp 10778-10794. Cornfield J (1974b). Interrogation of Holbrooke S. Seltzer, M.D. In Subcommittee on Monopoly (1974), pp 10889-10895. Cornfield J (1974c). Correspondence between Senator Gaylord Nelson and Neil L. Chayet, Dr. Jerome Cornfield, Dr. Christian R. Klimt, and Dr. Jeremiah Stamler. In Subcommittee on Monopoly (1974), pp 11507-11523. Cornfield J (1975). A statistician's apology. Journal of the American Statistical Association 70:7-14. Cornfield J (1976). Recent methodological contributions to clinical trials. American Journal of Epidemiology 104:408-421. Cornfield J (1978). Randomization by group: a formal analysis. American Journal of Epidemiology 108:100-102. Jerome Cornfield Papers: Historical Note. Special Collections Department, Iowa State University. 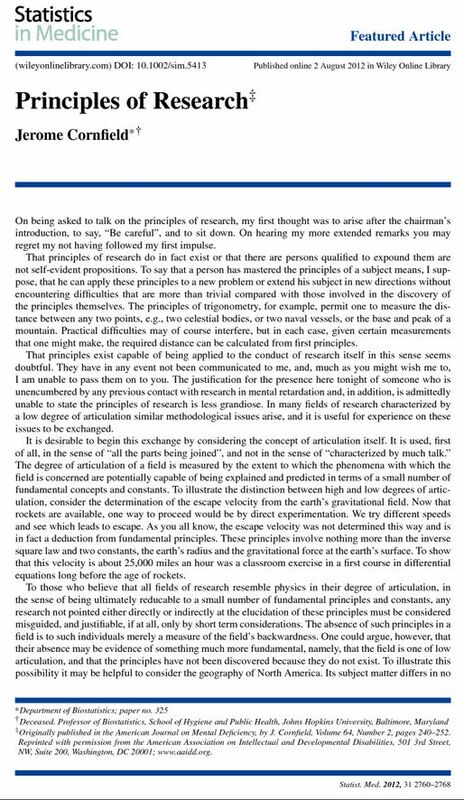 2004 Jan Hajek Causation and Confounding Milo Schield: "Jan has a most-interesting mind. He spotted an unwarranted step in one of my papers. As I recall, he said he figured out how to handle packet 'collisions' on the early internet." Observational Studies. Springer Series in Statistics, New York, Springer. First edition 1995, second edition 2002. Design of Observational Studies. Springer Series in Statistics, New York, Springer, 2010. From association to causation in observational studies: The role of tests of strongly ignorable treatment assignment. Yu, B. and Gastwirth, J.L. (2008). A Method of Assessing the Sensitivity of Cochran-Mantel-Haenszel Test to an Unobserved Confounder. Philosophical Transactions of the Royal Society Mathematical, Physical and Engineering Sciences-A, 366, 2377-2388. Gary Taubes: 1995 Epidemiology Faces Its Limits. Science. 1995 Jul 14;269(5221):164-9.